"The Atlanta BeltLine is the most comprehensive transportation and economic development effort ever undertaken in the City of Atlanta and among the largest, most wide-ranging urban redevelopment programs currently underway in the United States. The Atlanta BeltLine is a sustainable redevelopment project that will provide a network of public parks, multi-use trails and transit along a historic 22-mile railroad corridor circling downtown and connecting many neighborhoods directly to each other." Awesome, right? And I happen to live right on the BeltLine, in the Poncey Highlands/Old Fourth Ward section of the Eastside Trail, so yay for me. Having this great resource right outside my door is fantastic because it puts me in walking distance to a handful of really good restaurants and bars in which to eat and drink. And we all know I love to do both of those things. And this is where YOU come in. You can visit me and therefore, take advantage of this adventure during your time here; OR you live here already and you can use this info to embark on an exciting pub crawl of your own (just don't forget to invite me) on a slow Saturday or as a new riff on your "Sunday Funday" routine. I'm guessing you are on board. If it's a beautiful day, we'll grab a seat on their fabulous patio, order Bloody Marys and the Nashville Hot Chicken Biscuits (that's one order pictured above -- you may want to split with someone) and let the good feelings rush over you. You feel revived now right? Still feeling hungry? OMG you pig! Just kidding. I'm always hungry. But let's not go overboard - this is only the first stop. Krog Street Market, Inman Park. 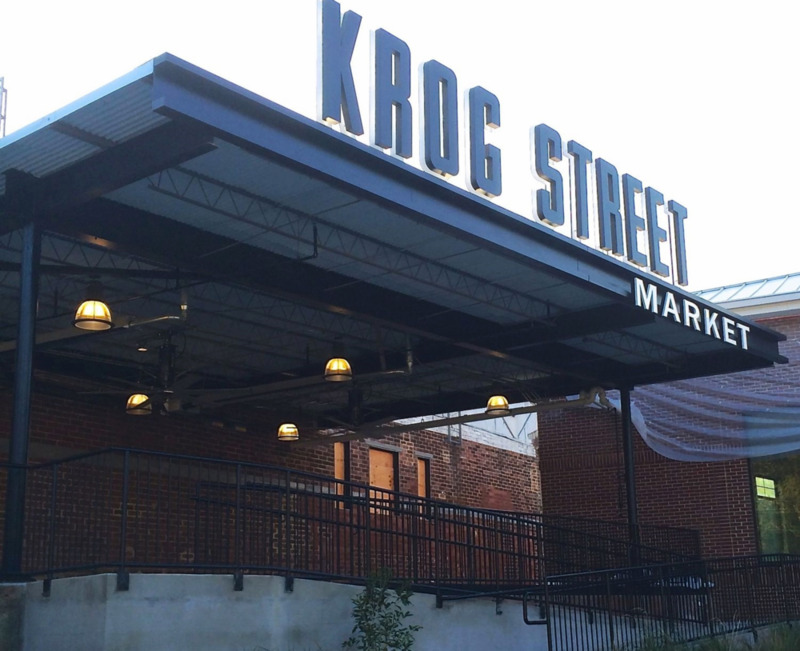 Just about a half a block from Ladybird we'll run right into Krog Street Market. The newest addition to Inman Park, KSM is a 1920’s warehouse re-purposed as an indoor market with stalls to sell produce, goods, and prepared food, alongside a few restaurants and retailers (including Hop City - a craft beer superstore that also hosts a bar where you can grab a beer to drink as you're strolling around the market). We can poke around inside a little if you want, but since it's probably a nice day out (it usually is in the ATL #brag), let's stick to patio living. In this case: Superica. Superica, Inman Park. Superica is the latest restaurant concept from Chef Ford Fry, Atlanta's latest "can do no wrong" super chef. Superica adds to Chef Fry's growing list of fabulous spots, including The Optimist and JCT Kitchen in West Midtown; King + Duke and St. Cecilia in Buckhead. This one's a "Mex-Tex" concept and builds on classics that Chef Fry and his partner Kevin Maxey picked up from their native Texas. 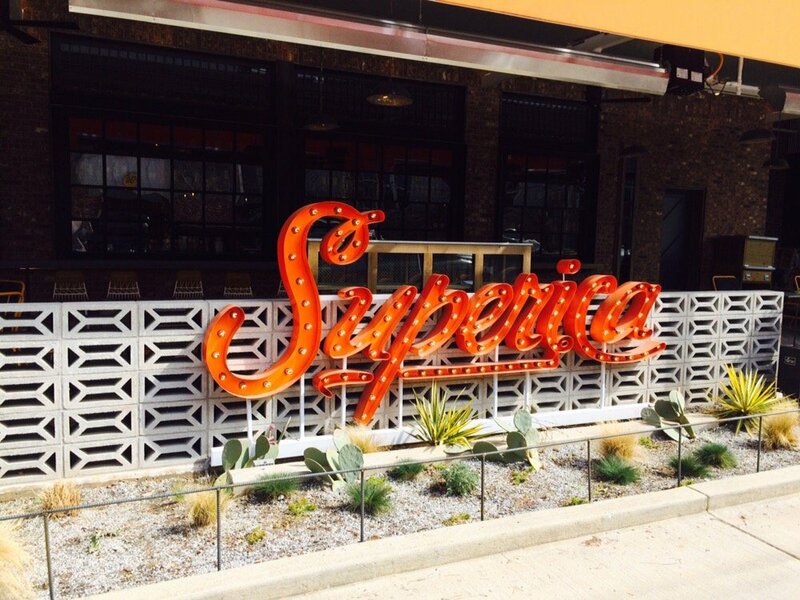 Once we wear out our welcome at Superica, let's get back on the BeltLine and head to Parish. But WAIT...we're going to pass right by Ladybird again. Hmmm...I don't normally advocate for re-dos on a pub crawl, but they do make a tasty Moscow Mule and have a pretty creative beer list. Plus they have table shuffleboard. Use your discretion, but it won't hurt to stop, just for a few minutes. OK we're back on track and headed to Parish. Parish Brasserie and Cafe, Inman Park. Parish actually isn't on many people's radar, since it's been around a long time with an up and down rep for food. But they have a new chef on board and a new concept and it's one of the most beautiful spaces in Atlanta (it is a converted pipe factory), so it's definitely worth a stop; plus they have food and booze. Parish also has a great beer and oyster selection (bonus if you are there on Sunday: at 5:30pm they have $1 oysters and $2 drafts). So belly up to the beautiful bar and order a dozen (special or no special) and a pint of Fu Man Brew, a yummy wheat beer from local brewer Monday Night Brewing. If it's a beautiful day and you still want to be outside, check out Parish's Neighborhood Cafe around back. The cafe serves sandwiches and salads, a selection of local beers on tap and has outdoor picnic tables where you can hang out and enjoy the sun. Either way - we're drinking beer. Get a coffee and I'll punch you in the belly. Next stop on our journey through the Inman Park stretch of the BeltLine is Barcelona. Barcelona Wine Bar, Inman Park. Barcelona is always hopping - no matter what time of day it is - which is perfect for our pub crawling festivities. This is a great place to meet new friends or run into the ones you already know. Head to the bar side and grab a bar stool or table (or grab a table on the patio) and try a glass of wine (or two or three...) from Barcelona's extensive wine list. Or order a pitcher of one of their fruity sangrias. This is also the perfect time to try a mix of Spanish meats and cheeses (and don't forget to ask for complimentary bread and olive oil) as a snack. Once we have a few glasses of wine/sangria up in us, we should be feeling pretty good, right? So we should keep going! Next stop along the trail: Two Urban Licks. Two Urban Licks, Old Fourth Ward. TUL is one of my favorite restaurants in Atlanta. Hands down. The space. The food. The decor. The vibe. The jazz, sometimes blues, band playing in the corner. It's a win-win-win-win-win. Plus they have a great patio that overlooks the BeltLine as well as two full size bocce courts if you're so inclined. You absolutely must try the Salmon Chips (an appetizer so popular, they have to assign one prep cook to that station all night) so you better still be hungry. They also have a selection of wines served right from the barrel (from their "BARREL TOWER OF WINE"). I think it's safe to say we'll be hanging here for awhile...so let's play some bocce and enjoy the patio, K? After Two, we will jump off the Beltline, right down the hill on Ralph McGill and saddle up to Bantam Pub. Bantam Pub, Poncey Highlands/Old Fourth Ward. Bantam is a small but cozy neighborhood pub and is the newest addition to our neighborhood just off the BeltLine. The owners are chill, the food is good and the beer is cold. We'll wind down our adventure here and whether you feel like you want to keep going into the night, or have a nightcap and hit the bricks, you've come a long way and you should feel bloated....I mean, proud of yourself. Oh and I feel obligated to tell you what's good here - in case you find yourself drunk and famished (it happens, don't be ashamed). The hanger steak is probably my favorite thing on the menu, but I hear you can't go wrong with the burger or the lobster mac and cheese as well. There you have it! Sounds fun right? Go BeltLine! Visit Atlanta!